A not-very-well-researched story on television program EenVandaag (Dutch language). Doctor Gerry Jager of the University Medical Center of Utrecht says that smoking marijuana does no long-term damage to the developing brains of young people. Not many details of the research are presented, but it appears to have involved MRI scans and puzzle solving tests. My objection is that the conclusions were based on just 40 subjects, who were followed for two years (!!). Methinks there are better data out there. The results are being presented at an unnamed conference today in Vienna. Leaving the science _ including the evidence in the British Medical Journal that depression and mental illness may be caused (not correlated or associated but caused) by heavy weed use _ Jager is a little bit better when she's just talking common sense. She warns of socialization & financial problems that could be caused by too much weed, and says that time spent stoned isn't exactly helping young people learn what they need to to prepare for their future. And mentally ill people shouldn't smoke. "That's the reality," she says. 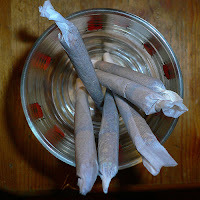 However, "There's a large group of youth that smokes a joint now and again, and who stop smoking at a certain moment. After 10 years they're all good citizens with a job and a family. That's also the reality." Also on the basis of 40 subjects.